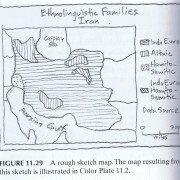 Using Text on Maps: Typography in Cartography | Jill Saligoe-Simmel, Ph.D.
January 2, 2009 /11 Comments/in Cartography /by Jill Saligoe-Simmel, Ph.D.
Typography is the art and methods of arranging type, type design, and modifying type glyphs. In traditional typography, text is composed to create a readable, coherent, and visually satisfying whole that works invisibly, without the awareness of the reader. Even distribution with a minimum of distractions and anomalies are aimed at producing clarity and transparency. The goal is legibility and readability. Typography for cartography can be more complex than traditional typography because of complex text placement and potential density of features, visual hierarchy, and overall look and feel. 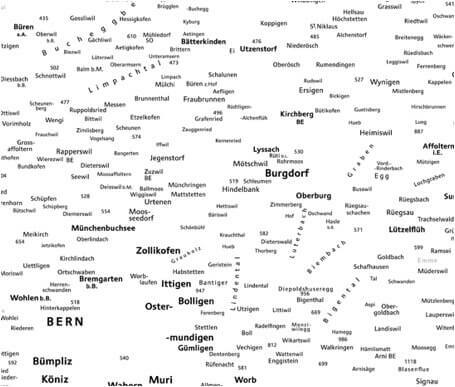 On maps, text often represent features as symbols in their own right. 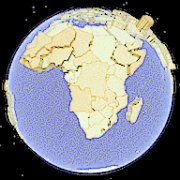 There is often interplay between text and other multi-layered map features such as symbols, background colors, and textures. However, the overall goal of legibility and readability remains the same. A typeface (also known as font family) is a group of fonts, designed to be used in combination and exhibiting similarities in design. One member of a family may be rendered in italic, another bold, another condensed or using small caps. Each font of a typeface has a specific weight, style, condensation, width, slant, italicization, ornamentation, and designer or foundry (the variants). For example, “ITC Garamond Bold Condensed Italic” means the bold, condensed-width, italic version of ITC Garamond. It is a different font from “ITC Garamond Condensed Italic” and “ITC Garamond Bold Condensed,” but all are fonts within the same font family. Individual letters, number, punctuation mark, or other symbol, called the type glyphs, are created and modified using a variety of illustration techniques. Serifs are semi-structural details on the ends of some of the strokes that make up letters and symbols (also known as Roman). A typeface without serifs is called sans-serif, from the French sans, meaning “without” (also known as Gothic). In traditional print, sans-serif fonts are more typically used for headlines than for body text. The font weight refers to the boldness or lightness of the glyphs used to render the text. The font stretch indicates the desired amount of condensing or expansion in the glyphs used to render the text. 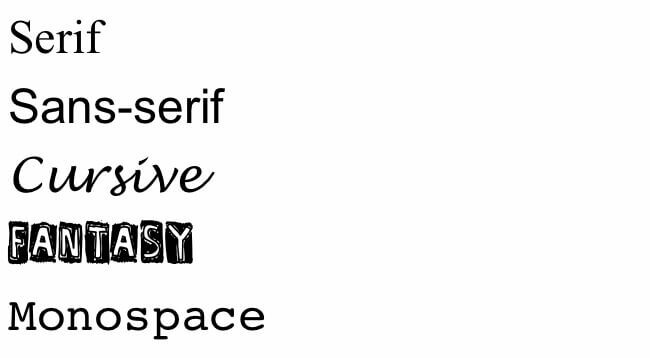 The font size refers to the size of the font from baseline to baseline. 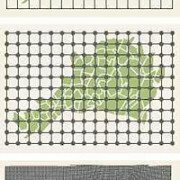 As cartographic methods became more mechanical in the mid-20th century, the Leroy Lettering System was developed to help cartographers produce consistent, legible text. 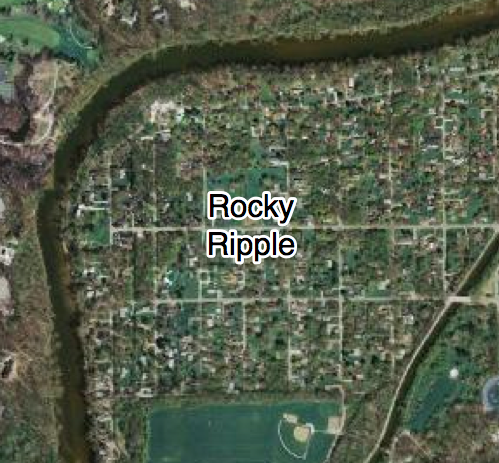 The Leroy type style is popular on maps of that era. Today, the font “Sublime” closely mimics the Leroy style. Leroy Lettering System (1) Phillips, R. J., Noyes, L. and Audley, R. J. (1977). The legibility of type on maps. Ergonomics, 20, 671-682. 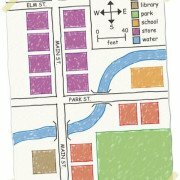 TypeBrewer is a highly recommended place to begin your selection of type for your map. 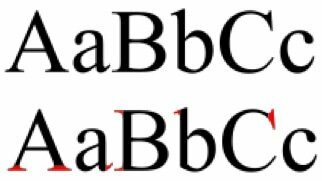 In the TypeBrewer system, “Formal-B” and “Informal-B” are good choices if you are using pre-loaded system fonts. “Formal B” is a good choice for web fonts. Other listed type schemes require that you obtain fonts from external sources. 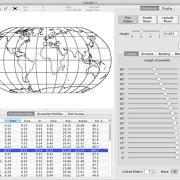 These provide excellent solutions for cartography, though they can sometimes be expensive. There are many sources of fonts available for free and for purchase via the web. For example, Cisalpin is a contemporary typeface marketed as the ideal typeface for cartography. The overall arrangement of type involves the selection of typefaces, point size, line length, leading (line spacing), letter-spacing (tracking), style, effects, and kerning. In typography, kerning is the process of adjusting letter spacing in a proportional font. In a well-kerned font, the two-dimensional blank spaces between each pair of letters all have similar area. 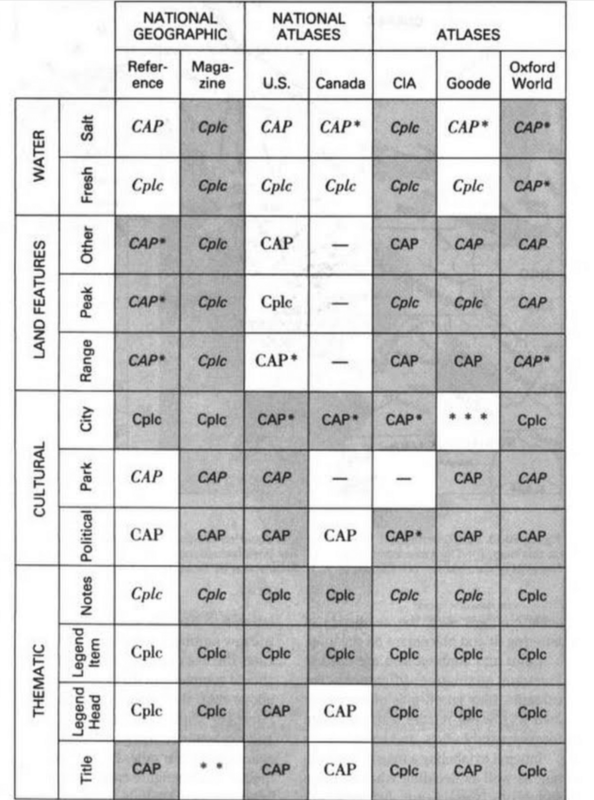 I usually need to place text over aerial photos for scientific reports and I need the clearest type with the most unambiguous letters and numbers. For example number 1 should always be distinct from small l and capital I should have serifs even if in a sans-serif font so that roman numerals look OK and to be different than small l. I also would love it if zeros were distinct from capital O. Usually I just use Tahoma/Verdana which are not particularly attractive but meet most of the criteria and are also widely distributed if I share a file without embedded fonts. Any other ideas? I’m looking forward to Ortelius and I hope that it will have the ability to place a halo around text to make it more readable. Typical Mac text dialog boxes only allow shadows, although I sometimes get around this by filling the text box with a translucent white that is almost as good as a halo (but usually is too large). Hopefully controls over transparency will be available in Ortelius. Hi Mike, You’ve put your finger on a number of issues regarding font typeface selection. This graphic show a handful of nice fonts for use with mapping, looking at the trouble spots you’ve identified. The sequence is: one, lower case L, capital i, lower-case o, capital O, and zero. While there are some great fonts out there to choose from, these are fairly common system fonts. 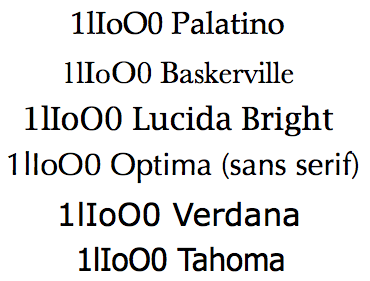 I think 1 and l are too close in Baskerville, and personally think Lucida Bright and Palatino work nicely for the purposes you’ve mentioned. For comparison I included Tahoma and Verdana. Ortelius can place halos and/or outlines around text to make it more readable. You can easily control the thickness of halos, as well as colors and transparency. Here is quick sample with b/w text. We are getting very close to the first release of the Ortelius Standard edition! I like that Lucida series and for serifs for titles and such I particularly like Calisto, but I mostly use sans-serifs for map annotation and the Lucida Sans has those l I problems. I’ve always found those anomalous serifs added to capital “I” in sans serif typefaces, making it look like “?,” absolutely hideous in appearance, and I never use them in my own handwriting. For that reason, I despise such typefaces as Comic Sans and Verdana. A far better strategy, which I use in my own handwriting, is to twist the bottom of lowercase “L” to the right, as the Trebuchet font does. As for number “1,” most typefaces have that extra stroke at top left, so putting anomalous serifs on the bottom is really never necessary. When using an ALL-CAPS, font is there any occasion to use lower-case letters? Specifically surnames such as McDonnell or MacArthur. Would they be McDONNELL and MacARTHUR or as I would advocate, MCDONNELL and MACARTHUR. Seems obvious to me , lower case doesn’t exist in an ALL-CAPS world. Agreed. A big advantage of CAPS is also letter-spacing it across wide polygons (and you certainly wouldn’t want mixed caps in that scenario!). Anyone have examples to the contrary? In serif letter, those are the letter start with tin tips and end also with tin tip.e.g universe character and the new time Roman character. Sans serif letter are commonly used In cartography,each has same weight.